I'm hoping this blissful four day Easter weekend will allow me to gain ground somewhat on the many blog posts I need to do on this humble blog, especially as my day job has been so busy that it has left me too tired to be blogging in the evenings lately. Top Knot Detective (written and directed by Aaron McCann and Dominic Pearce) isn't a horror, it is a comedy mockumentary about a fictional TV show that if real would have been something I would have loved to cover here. The documentary is about an obscure cult Japanese Samurai/Detective series from the early 1990's called Ronin Suiri Tentai which came to be known as Top Knot Detective in Australia. 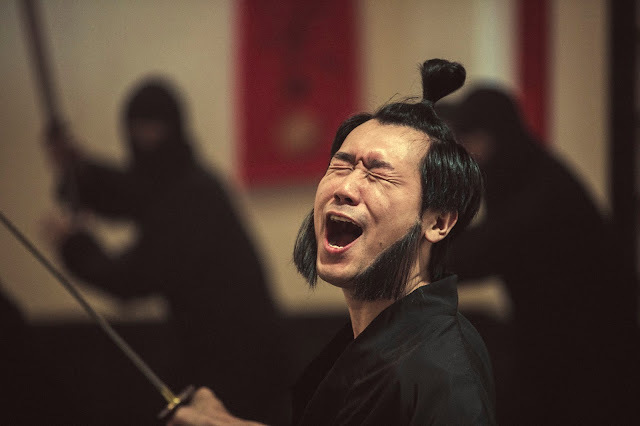 In the show a Samurai detective - Sheimasu Tantai becomes a Ronin and sets out on a path of vengeance to find the man responsible for the death of his master. The documentary charts how this show came to be, as well as follow the history of the man who played the main character - Takashi Takamoto (Toshi Okuzaki). It follows the events that led to the cancellation of the series, and the downfall of Takamoto. 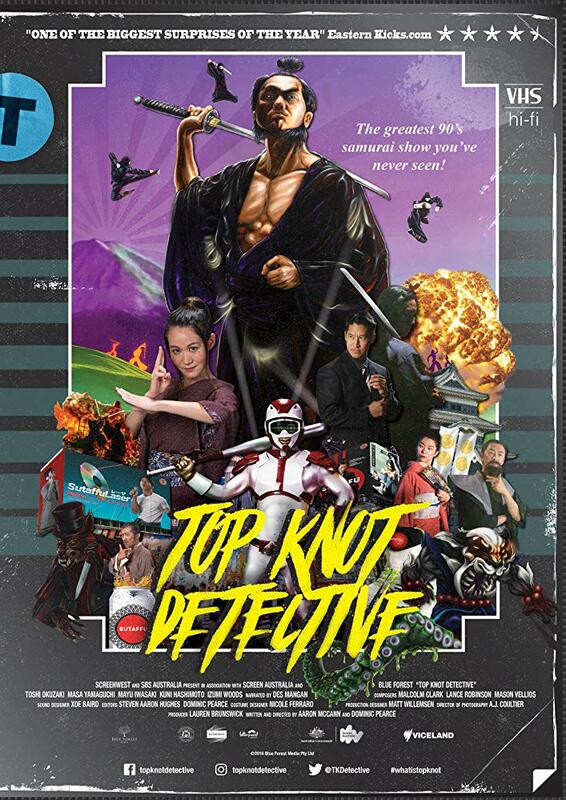 Top Knot Detective does for Japanese Samurai shows what Garth Merenghi's Darkplace did for horror shows. Both have a documentary format and focus on shows that look absolutely terrible and which star a lead actor who is completely deluded as to the quality of what he is working on. It is important that the show itself is something that is so bad it's good and that is the case here. The overriding thought watching this was just how much I wish Top Knot Detective actually existed, it looks amazingly awful. That show itself is represented so well here, the rubbish special effects, the abysmal acting, and the editing and pacing combine for something so compelling. The story of a man on a path for revenge was something that I would love to see, and could really imagine working well as a show! Being based around the creation of this show it isn't so much like Darkplace which centered on individual episodes, but from the start to the end we get to see the evolving story which leads to some satisfying resolution for that part of this film. 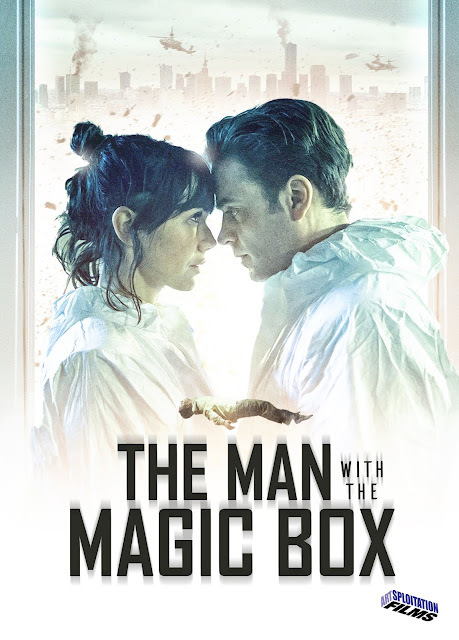 Polish sci-fi film The Man with the Magic Box (original title Czlowiek z magicznym pudelkiem) isn't a horror, yet it has attached to it elements that I do quite like and find it hard to pass up on when offered for review. This features both a dystopian future, as well as time travel, both things I enjoy seeing. The story begins with Adam (Piotr Polak) being given a new identity and a new job as a janitor in Warsaw 2030. He is a bit of a misfit and seems out of place in this future world that has elements of 1984 to it. In the office block where he works he forms an attraction with Gloria (Olga Boladz) and the two start an unlikely relationships of sorts. Meanwhile Adam has discovered a strange radio in the old apartment building he is living in, one that it is suggested could be a conduit to allow him to travel back through time to the 1950's. The look of the near future Warsaw is very well done, streets are murky and filled with dusty ruins, offices are sparsely decorated and the future technology is very minimalist. Drones fly overhead, VR is a common thing, computers are holograms, there are frequent power cuts, and water is rationed. All old technology has been banned in this future state, while it seems an ongoing war is happening. This was all brought together to create a different sort of future to the usual neon signs everywhere in films such as Blade Runner. There was also a nice line in future clothing that really stands out as something unusual, glowing shoes, strangely coloured clothing is unified throughout to really make the old fashioned garments that Adam and later Gloria take to wearing stand out. 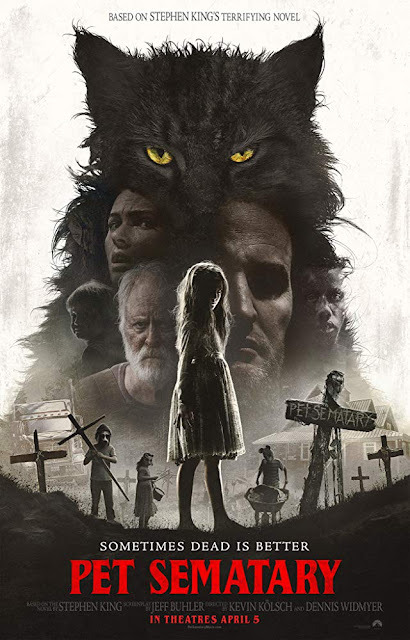 As I said back in 2012 when I reviewed Pet Sematary Two, I liked the original movie version of Pet Sematary but I couldn't really tell you much about it due to near totally forgetting what happened. I thought that would help with this new remake of Stephen Kings (apparently) classic horror novel. This wasn't a bad film but even with the changes made to make it stand out from the original it did feel a little bit familiar. 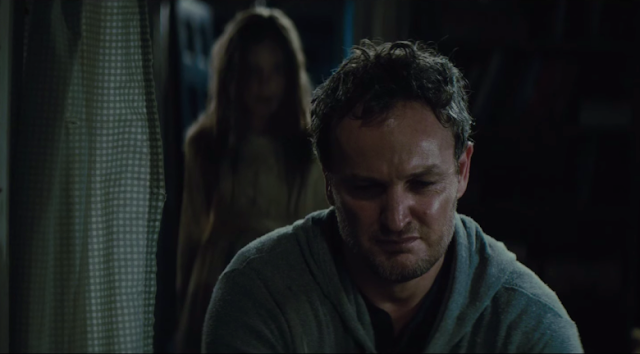 Louis (Jason Clarke - Terminator Genisys), his wife Rachel (Amy Seimetz - Alien Covenant, Stranger Things), and their two young children Ellie and Gage move to a small rural town. They soon discover quite near to their new home is a pet cemetary which their next door neighbour Jud (John Lithgow - Rise of the Planet of the Apes, Dexter) explains is where the townsfolk have always buried their pets. One day Ellie's beloved cat Church is found dead, Jud tells Louis there may be a way to fix things without Ellie discovering this. In the dead of night Jud leads his neighbour to a remote ancient burial ground deep in swamp land and gets him to bury the cat there. To Louis's surprise the next day Church turns up seemingly alive and well, however the cat has changed into something quite...wrong. Later that year a tragic accident occurs, and Louis in his desperation decides against Jud's advice and does something from which there is no turning back. Often remakes feel pointless, maybe more so when the original is such a classic (it is one of the only film adaptations of King's books that he states actually scared him). There are some key changes done to set itself apart both from the original film as well as the book. For anyone who hasn't seen the trailer it will be a mild spoiler but here, rather than have the two year old toddler Gage die in an accident it is instead his older sister Ellie who is brought back changed. The young actress Jete Laurence was most impressive. I have said it many times before but children can make or break horrors, usually due to their inexperience they are not the best, Laurence though shines. She essentially plays two different roles in Pet Sematary, her nice normal happy self, and then the very twisted dark version that comes back. 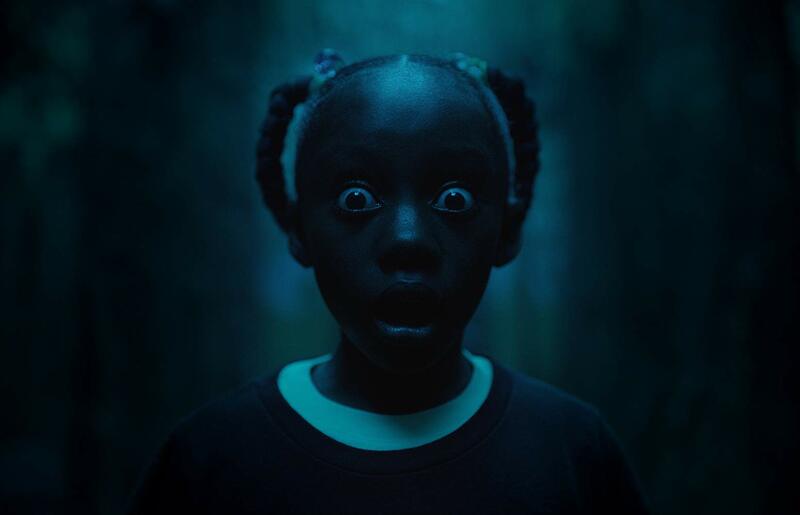 She is the best thing about this movie, genuinely creepy and actually pretty darn freaky. I loved her scratchy voice, the sheer presence she brings to her scenes was also impressive. Being an older child it means there is much more dialogue between her and Louis, her descriptions of the afterlife are quite haunting, while despite her small stature she is a formidable creature! I will start off my review of the latest season of The Walking Dead to state once again how I just do not understand people who say it has gotten terrible. Half the time it seems the people saying this are the same ones who admit to not even having watched it for years and years and years. The Walking Dead is my favourite TV show and I make no apologies for how much I love it, despite the constant issues I have with how it all plays out. I felt season 9 could be a difficult one, it was already revealed one of the main actors was going to be leaving the show, while taking place after the end of the Saviours story arc meant the biggest threat was now gone. Some great decisions moved the story along in a way that I did not expect though. Spoilers for previous seasons, as well as minor spoilers for this season to follow! So season 9 of The Walking Dead takes place over two different time periods. Initially we follow Rick (Andrew Lincoln) as he attempts to keep together the disparate groups of Hilltop, Oceanside, The Kingdom, New Alexandria, and the now neutral Sanctuary. Trying to create Carl Poppa's dream of a united society is harder than expected though, especially when some people hold violent grudges. Then not even halfway through the season there is a time jump of six years. During that time leap all the different settlements have retreated into themselves and became distant from each other. 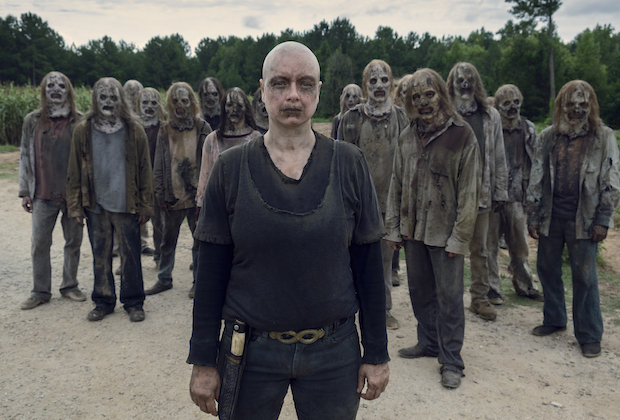 However the arrival of a new group of creepy zombie skin wearing foes known as The Whisperers, led by the cold hearted Alpha (Samantha Morton) means that once again everyone must put aside their differences to come together. Going into this I knew a key character was going to leave, I wondered how on earth the show could manage to keep going with such an integral person gone. The time jump turns out to be the perfect solution to that problem with so much changing, and so many new characters appearing that it doesn't matter too much that that particular character has gone. Over the seasons as the cast got larger and larger there was a reduction in the core casts individual screen time, and now it sits at a point where there isn't really anyone I would say is the main character. 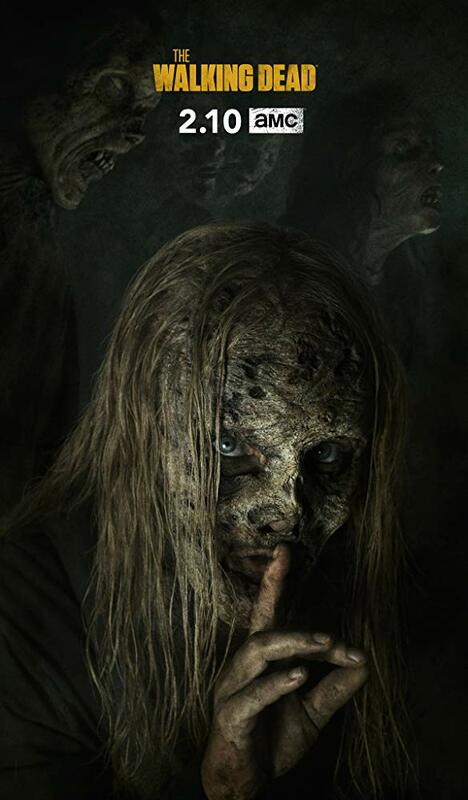 Initially the second third of the show deals with a group of new characters who looked they walked right in off the set of Fear the Walking Dead. I mean by this that they seem B-list compared to the built up characters. By the end of the season though, while I could not tell you a single name of any of the five strong group I felt they were well on their way to settling into the show. They include among them a deaf and mute girl which was someone who really felt like a great addition. One scene involving her in a cornfield being pursued by zombies really stood out due to the sound being muffled to reflect what she herself could hear. It made for a very disorientating and claustrophobic sequence. I can say with some certainty that Us was a horror film I had been looking forward to seeing. 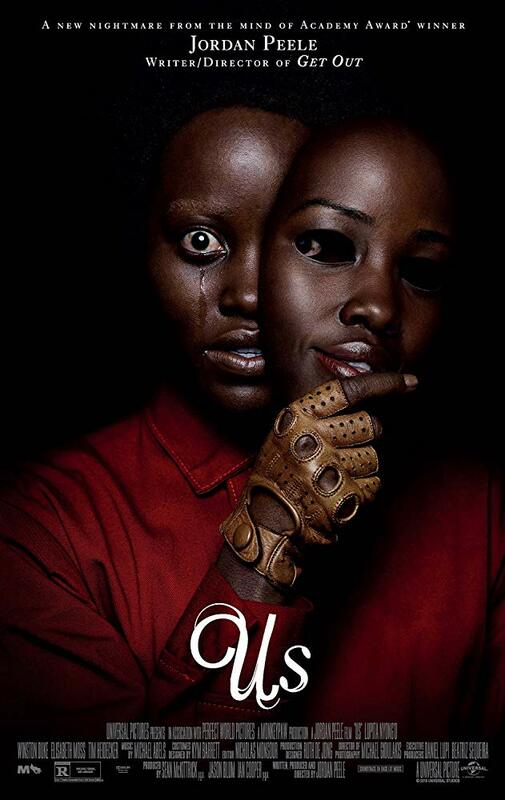 It is after all the next film from Jordan Peele, he of Get Out fame. I really liked the idea behind Us, though it did suffer a little from the same issue I had of his previous film. Again this is very much a social commentary, though where his first film seemed to be about racism, here it seems to be more looking at the class divide in America. Adelaide Wilson (Lupita Nyong'o - Black Panther), her husband Gabe (Winston Duke - Black Panther), and their two children, Zora and Jason have headed to their holiday home in Santa Cruz for a getaway. Adelaide is nervous about the trip due to a traumatic incident that took place in a hall of mirrors by the beach there as a child. Her nerves seem warranted as the first night at their home they are confronted by four mysterious people who break in and hold them hostage. The family are horrified to discover the intruders are dopplegangers, twisted versions of themselves who plan to torment and kill them for reasons unknown..
Purely based on Peele's previous film, and the fact the main characters are a black family I assumed this would be looking at issues of race. It turns out however that the skin colour of the characters is not really a factor at all this time around, they seem like a relatively wealthy middle class group, the people out to get them brought to mind H.G Wells 'Morlocks' from The Time Machine - uneducated, brutish, poor rising up against those above them. 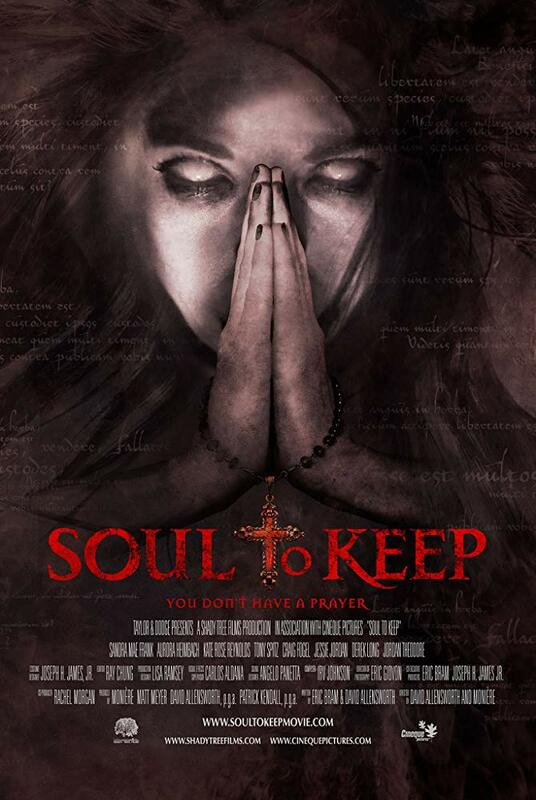 Based on the trailer this seemed like it would follow the path of a home invasion horror, yet this turns into something far more than that, mixing in elements that wouldn't be out of place in the zombie genre. Some street scenes seemed very apocalyptic in how they were set out. 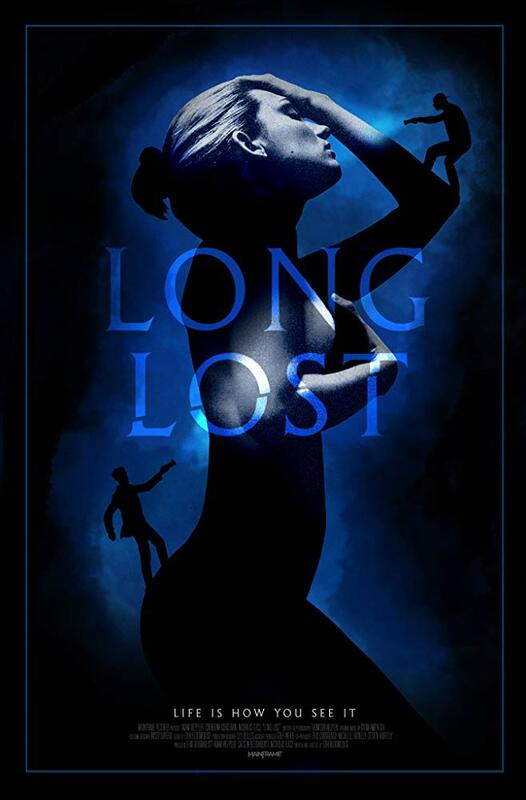 It wasn't long into the multi award winning Long Lost that I just knew this was going to be a memorable film. Directed and co-written by Eik Bloomquist (She Came from the Woods, The Cobblestone Corridor) this had a strong cast, a compelling narrative, and managed to sustain a feeling of sinister awkwardness throughout the 90 minute run time. 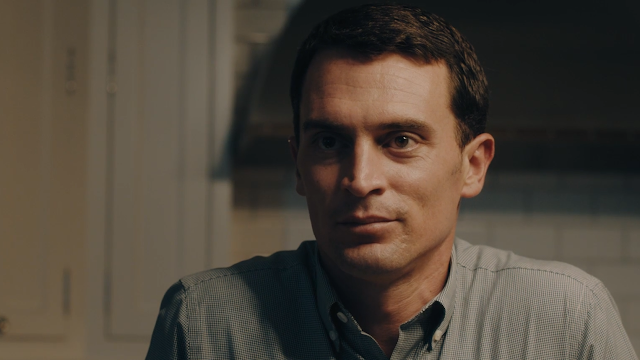 Average guy Seth (Adam Weppler) recieves a letter inviting him to the home of a long lost millionaire brother - Richard (Nicholas Tucci - You're Next) that he didn't even know he had, so he decides to go. Arriving at the remote luxurious mansion Seth soon gets put on edge by his newly found brothers abrasive and obnoxious personality, almost to the same degree that he finds himself attracted to his flirtatious and attractive live-in girlfriend Abby (Catherine Corcoran - Terrifier). As his unease grows the couples attention on him leads him to suspect that something really isn't right. This is one of those movies that I could tell I wouldn't be able to do justice to within the confines of a review. It is to Long Lost's credit that there really isn't much horror in the traditional fashion, yet throughout there was such a feeling of expectation of things to go wrong that the pressure just built and built. There is something that felt off, a feel of quiet malice. Even during the jovial moments of the trio playing silly games (such as a marshmallow eating contest, or torch tag) the directing and lighting make things feel oppressive and dangerous. It reminded me a lot of both Get Out, and even a little bit of The Wicker Man - the feeling of a character being in a seemingly normal situation but experiencing profound unease. I've mentioned it before but ALTER is a 'premium horror entertainment brand' that showcases cinematic horror shorts from around the world. It operates on multiple platforms including YouTube, Facebook, Instagram, Twitter and its own website. A few weeks back horror series The Outer Darkness joined its ranks of films and shows. 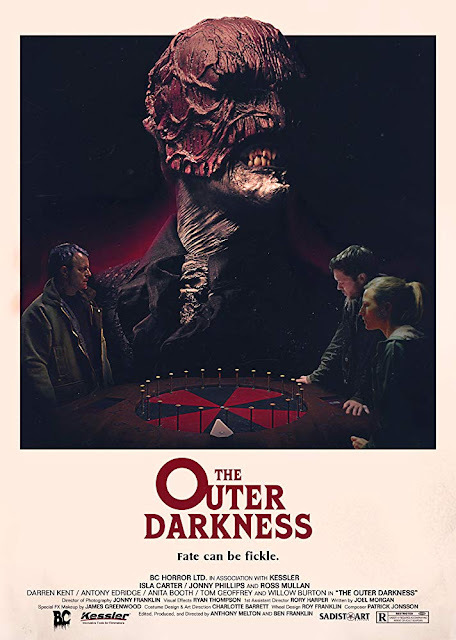 Originally released in 2015 as a short film, directed by Ben Franklin and Anthony Melton, The Outer Darkness has now been split into three parts and released as a series. Each of the three parts is roughly split into around eight minutes and by the end Jenny's story at least is told. Part one introduces the support group and the various characters within it. while starting off the anthology segment. Part two contains the majority of the gambling storyline, before part three brings it to a close and takes us back to the present day. I found this to be quite captivating with what was going on, there were both unexpected twists and a suspenseful atmosphere. The wraparound story was something that felt like it could really go somewhere, especially with later revelations. I felt if this was made into a proper anthology show there were a lot of places to go to if each of the characters in the meeting got their own segment, that would be something interesting. As it is, adapted from a film I don't know if there will be more to come, or if this is it. Regardless this had some decent acting, and some nice creature effects. With most this taking place in a dark room it did come across as a bit sparse, though this darkness also focussed the attention on the insular drama whose subject matter occasionally made it feel slightly ridiculous. Still, I have to admit my attention was drawn. There is a lot of good stuff on ALTER, The Outer Darkness is no different. Check it out for yourself below. Back in August last year I got to check out two music videos/short films that were made in part thanks to composer/producer John Whitaker (1i2c). Both Undertaker and Umbilichord used a great blend of music and visuals to tell a story. Now he has released a new hybrid - Zombie, which of course I was immediately interested in. This six minute short sees the emergence of a classical zombie (John Whitaker) who emerges from a sack in a biohazardous area and stumbles off into a nearby town. Meanwhile a more human character (Richard Markworth) leaves his house, and makes his way across the town, eyes glued to his phone throughout his journey. So the idea behind this is very obvious, the social commentary of humans acting more and more like zombies themselves is one that has been done many times before (most notably by George Romero in Dawn of the Dead). In these times it seems that contrast is all the more fitting with everyone owning mobile phones, and everyone for the most part seeming unable to leave them alone. There is a nice mix of the two different characters making their way through town which also had some nice distinctive camera work. The traditional zombie is full of close up camera work and dizzying point of view shots. Meanwhile the human character gets more straight camera work. This is all held together by the music which drones on in a relentless fashion which goes well with the two zombies walking ever onward. I most liked the zombie parts here, the camera work is fantastic, and there are some great shots, such as a hand on metal railings, and one part where the ghoul walks in front of the sun. John Whitaker was recently at Nova Nights: Progressive, Transgressive & Underground event where three horror films of Nicolai Kornum featuring his music were shown (Hammer Blows, Umbilichord and Undertaker, this was followed by a live interview between him and Billy Chainsaw, this took place on 21st March so I'm a little late mentioning that! Anyway, check out Zombie below and see what you think. 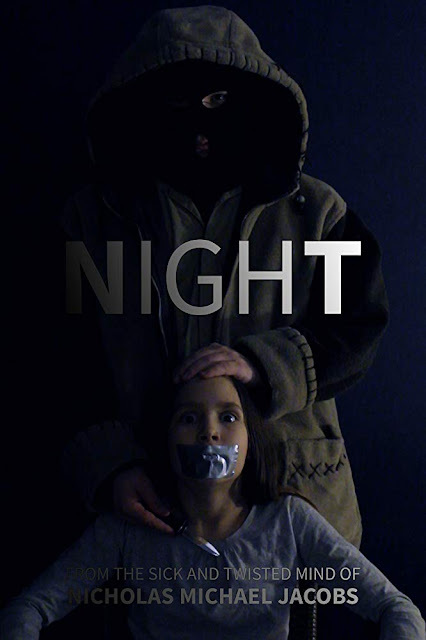 I'm currently getting in the routine of putting one blog post out every two days, so it was with nice surprise that the next film on my list to review - The Killers was a ten minute short. This was written and produced for the Playhouse West-Philadelphia 25 Day Film Project that took place between 5th October and the 30th October last year. It was created in ten days with apparently no budget and limited resources. The Killers is a fly on the wall mockumentary that follows three different serial killers as they go about their work. First off is Frank who targets teenage females, next we see Danny who targets people with personality disorders, and finally is Trish who goes after depressed males. Each of these three briefly talk about their work before they are filmed killing a victim, so as you might guess this is a horror comedy. As I was watching this the style of the fake documentary reminded me a lot of The Office, something the email I received about this actually points out. Like that show the camera operator makes you feel part of what is unfolding, this leads to some of the humour. In Danny's segment as he is hiding behind a pillar waiting for his victim he beckons the cameraman over to join him. Then later during Trish's part at several points she makes knowing glances at the camera, even leaning over and whispering "I'm going to kill him now". Then they also get the talking heads style interview parts where they get to speak more about themselves. I enjoyed this, yet it is pretty much the same joke told three times in a row. The killer and method of killing may be different but it all plays out quite similar. Due to being a limited time short there isn't a beginning or end wraparound to explain just what the aim of these killers being filmed was, or for what purpose. This was directed by John Woods, and written and produced by both him and Alex Webster, both these people also had roles in the short. The official trailer has been released so I will include that below.